I really am not looking forward to the new season. It isn’t that I dislike Autumn – I love it. I don’t hate winter, either. I just hate long grey days full of foreboding clouds and very little sunshine. I am solar-powered and the lack of sunshine through a long Pacific Northwest winter can sometimes pull me down. I am also not looking forward to the 22-mile one way drive in the dark and the rain. At least it will sneak up on me. I have looked into public transportation. It would take me longer on public transportation than it does to drive the darn thing, plus I would have to walk from one bus stop to another in several places and wait for over 20 minutes in at least one other place. That seems rather inefficient to me. I prefer to be inside a warm vehicle and moving, even if moving is only at five miles per hour. My car got in a wreck the other day. Just my car. It did this by itself, didn’t think to invite me. I park in the very far corner of the parking lot at work, between two large V-8 extended cab pick-up trucks. There is usually an empty space on either side of my car (which is a very small car when you park it next to big trucks). Apparently, someone parked right next to me. And apparently that person did a pretty poor job of backing out of the space. S/he hit my tire and then scraped across my bumper. The scrapes are several millimeters deep. At least it’s “just” my bumper. And my tire didn’t suffer any permanent damage, although I kept an eye on it all weekend. I’m just ticked because I know that whoever did it knew they did. And kept going. And didn’t leave me an “I’m sorry” note. 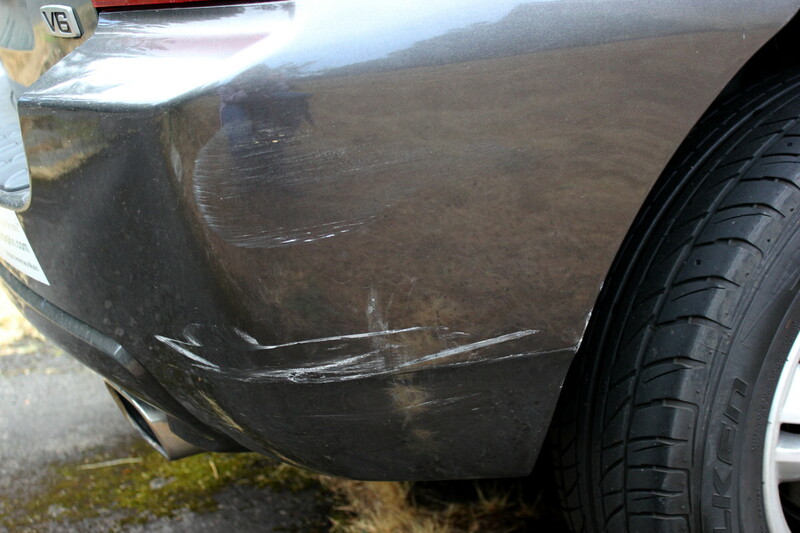 I wouldn’t have taken it to insurance – it isn’t worth the piddly amount insurance would give me to repair my bumper to pristine. I just want an acknowledgement that whoever hit me, knew it. I know they knew it. And, yes, I am looking at the bumpers of other cars in the parking lot this week. I’m sure I’ll find bits of black plastic on someone’s car. They left enough paint on mine. Something I love about Autumn: spiders. 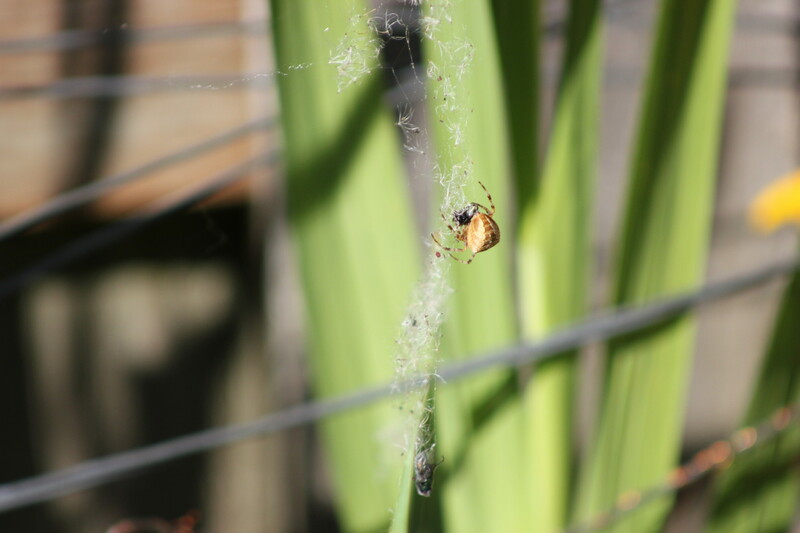 Spiders spend the greater part of the summer hunting prey and getting fat. Of the bazillions that are hatched in the spring, only a few million are still living by the end of summer. The larger they get and the greater a target they become. By the time winter rushes in, the few million have been reduced by half by hungry birds. But they will have left behind egg sacs full of kazillions of eggs that will hatch into bazillions of babies in the spring. Kill or be killed. Spiders have us in sheer numbers. She’s a hungry one, this one. I can tell you that she is probably an Argiope spider. She is definitely and orb-weaver (my favorite kind of spider). When I was a homeschooling mom, my favorite Science class to teach was taught in the Autumn: we could collect fat female spiders and make prints of their webs. People fear spiders. Most spiders won’t hurt you. I get the heebie-jeebies if one crawls on me and I know it. 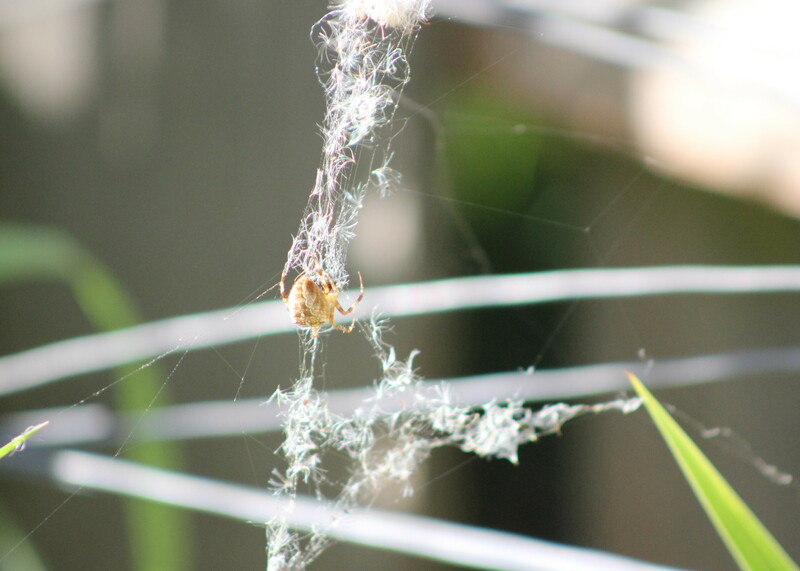 My photos of spiders give me the heebie-jeebies. But I love them and all their eight eyes and legs all the same. 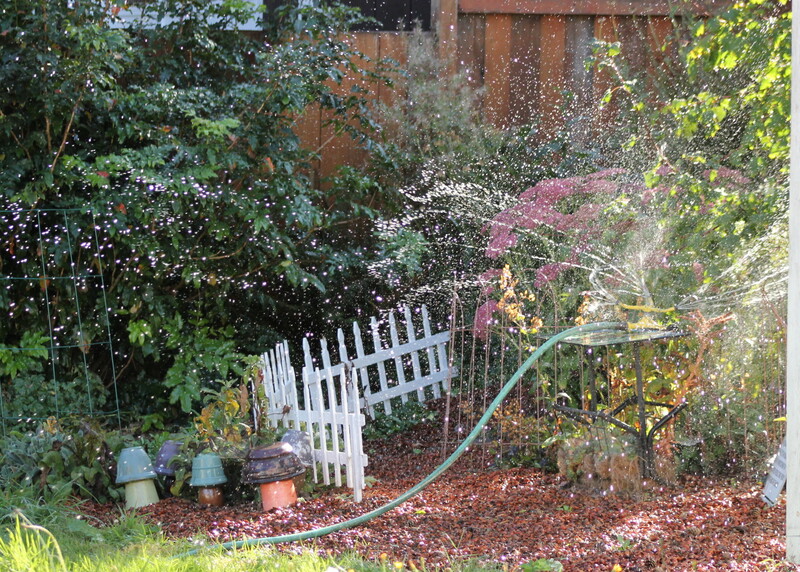 I am still watering. We have had a record dry summer here. No, we’re not (yet) in a drought, but it has been wonderfully dry and sunny with no end (yet) in sight. I have a few newly planted items that need the additional water. And a volunteer tomatoe that might actually give me eight fat, juicy tomatoes. I hope. I love the glitter of light on water droplets. Ah, Willamette Falls. Upriver dams, irrigation needs and a long, dry spell have left you… high and dry. I look down on the falls and am amazed at the amount of concrete that man has poured, trying to “improve” the falls and make the Willamette navigable to boats. There are locks on the far side. I do not have photos of the locks, but they are of a very old design: Leonardo da Vinci designed the type of locks we have on the Willamette. It’s pretty cool to watch them work. Occasionally, a stray boater drifts into the falls and goes over. When that happens, we’re always regaled with stories about how they “did not know the falls were there” or they “did not know how dangerous the falls were”. Seriously. 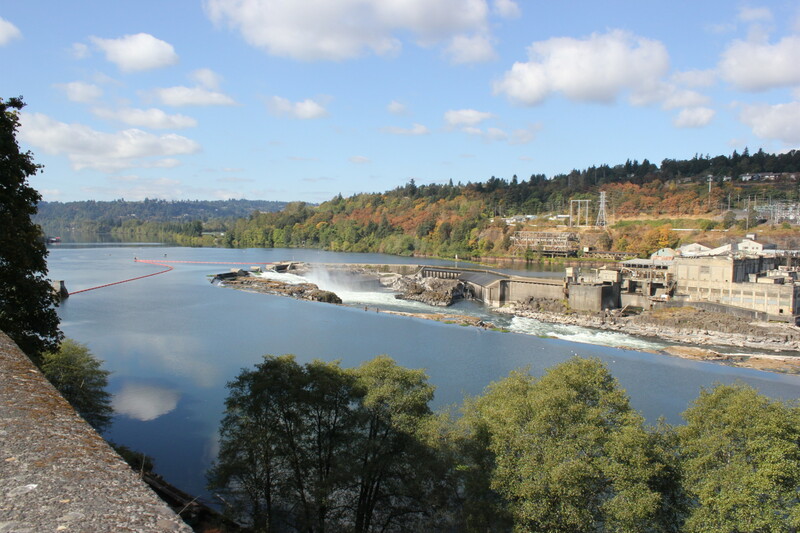 It’s marked well upstream that there are falls and Willamette Falls are the second largest falls in the continental USA (by volume). Eighteenth in the world. That’s pretty impressive for some falls right here in downtown Oregon City. I’ll save those photos to compare with when we hit flood season next year. One more thing before I wander off… It has been almost 2 years since I started this crazy medical adventure with a painless kidney stone. You can read about it in my archives, starting here (but I wouldn’t bother – just fast forward to now where it is a simple kidney stone that defies surgery – so far). Last surgery was unsuccessful. the kidney stone remained firmly entrenched in my kidney. This Thursday, my doctor is trying again. Instead of ultrasound technology, he is trying laser. There’s no guarantee. But at least we will have tried. I am praying specifically for a painless resolution to a bloody kidney stone. Key word: painless.